I assigned this lesson to students through GoogleClassroom. I provided them with a link to my example spreadsheet, gave them the link to the cargurus website, and provided them with my video tutorial (https://drive.google.com/file/d/1D6zXx783QvOa4cLMTTKqn74_OXRBjsQM/view), showing them how to use the Snipping Tool to select just the part of the vehicle they wanted to insert into their spreadsheet. Below is my example spreadsheet, showing the proposed layout with suggested column headers. The beauty of a spreadsheet is the ability to compare columns of information side by side. Students returned a week later to continue with their spreadsheet. They revisited CarGurus to see if their car had dropped in price or if it had sold. Students were encouraged to build a spreadsheet with a minimum of 6 cars. They were instructed to select a few of their favorite features…with one requirement: any car they put on their spreadsheet must have airbags and a clean title. Miles per gallon, expected monthly payment, years financed, and insurance costs would be discussed toward the end of the activity. Shown below is an example of a Connect 4 game I recently made. Most of my students had this game built and ready to play by the end of their class period. The game is initially built in Google Drawings. Students begin with a circle, duplicate it repeatedly, and then click on Arrange on the menu bar to distribute the circles horizontally and evenly. The game board has 42 circles altogether: 7 across, 6 down. Once the game board is complete, it is saved as a png file and then uploaded to Google Slides as a background image, which prevents players from accidentally deleting the game board during play. Once in Slides, students create playing pieces for themselves and an opponent. The game is then shared with a friend and play begins. Students can use Ctrl + Alt + M to bring up a comment box to “trash talk” their opponents, letting them know when a move has been made and to let them know who is going to be victorious. The game can be played synchronously or asynchronously. Some of our CRES 2nd graders have selected a number of topics to include and expand upon in their All About Me graphic organizers at Popplet, which are shown at the bottom of this post. Popplet is a subscription-based program and also helps me create visuals organizers in a snap. Besides Popplet, students can use Google Drawings to create their own graphic organizers. The video shown here, explains how to use Drawings to create a timeline. When teachers post assignments to Google Classroom, they should number each assignment consecutively as shown: #001, #002, #003, placing a hashtag with the number for the assignment into the title. This helps students quickly access specific posts when directed by their teacher and becomes more important as additional assignments are added to the stream. Students will use the keyboard shortcut Ctrl + F to find assignments by number. Click the video shown here to see a demonstration. Over the past few weeks, students in grades 2-6 have used Google Slides to create artwork for Dot Day, which is celebrated around September 15th-ish. Working with Google Slides requires students to log into their computer, navigate to Google Classroom, select the correct class (computer lab), and then scroll to reach and open their assignment. When their project is completed, students go to their file menu and download their slide as a png (portable network graphic). Once downloaded to their computer, students open a second tab and navigate to a collaborative digital canvas at Padlet. This helps students practice working with two web pages at once and an opportunity to bookmark the site. Students use Padlet’s add button to upload their image and add text. This gives students an opportunity to practice their digital citizenships skills and a chance to use technology tools to enhance their learning. Many students continue to use Slides for their own art, polishing their production skills. The video shown below highlights many of the skills used. 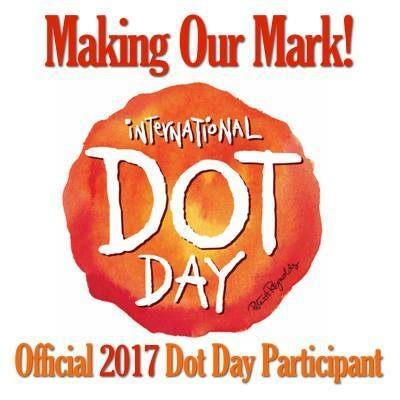 September 15th is International Dot Day. You probably didn’t know that? I discovered this last year and am ready to embark on another dot day celebration in the CRES computer lab. So, what’s it all about? Well, activities center around the book, The Dot. A humble title, yes, but the message is big: don’t be afraid to try. 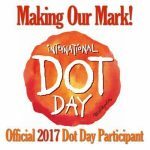 The subject of The Dot is a young student named Vashti, who becomes artistically confident after her teacher frames the simple dot Vashti had drawn on paper. When Vashti sees her work framed the next day, it emboldens her. With her new found confidence, she completes numerous “masterpieces” and has a gallery showing. Vashti soon becomes an inspiration to others. During the month of September, many CRES students, grades 2-6, will create dot art using Google Slides. The project will be delivered through Google Classroom. 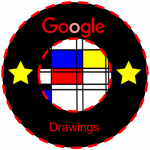 Each student will open their assignment in Google Slides and use a number of drawing tools to create their unique piece of circular art. When completed, students will upload their art to our Padlet canvas and share their masterpieces in celebration. The digital canvas shown below is currently awaiting the addition of student art. Stay tuned! At the very bottom of this post, you can view a video sampling of student art from 2017. 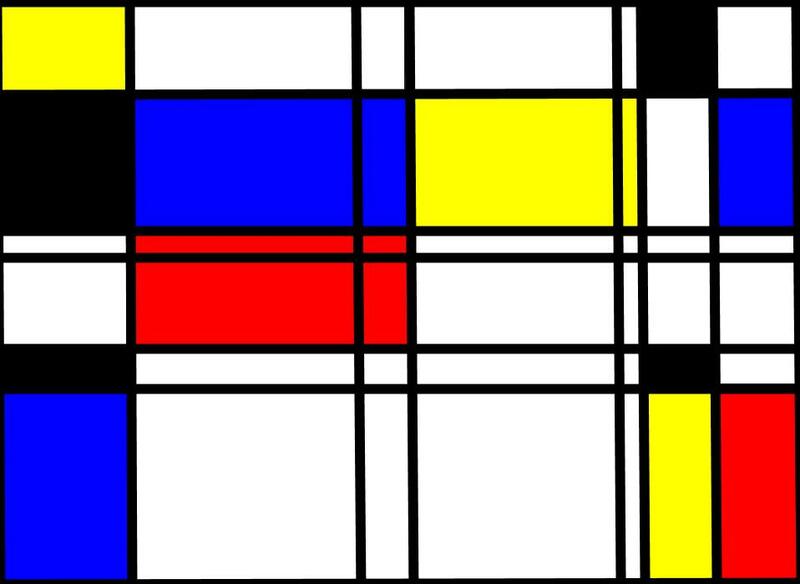 Our 6th graders will create a Piet Mondrian inspired artwork during the first trimester. Piet Mondrian’s work is easily recognized by his use of primary colors, the use of horizontal and vertical lines, and the primary values of white, gray and black. It was a form of art he called Neoplasticism. Students will use Google Drawings to create their art and then share it on the digital canvas shown below. I deliver their assignment through Google Classroom once all students have joined my classroom. It’s an awesome way to organize and collect student work. This summer I started following Alice Keeler on Twitter. 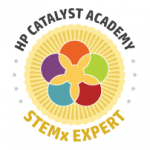 Her blog, Teacher Tech, is always loaded with great ideas. 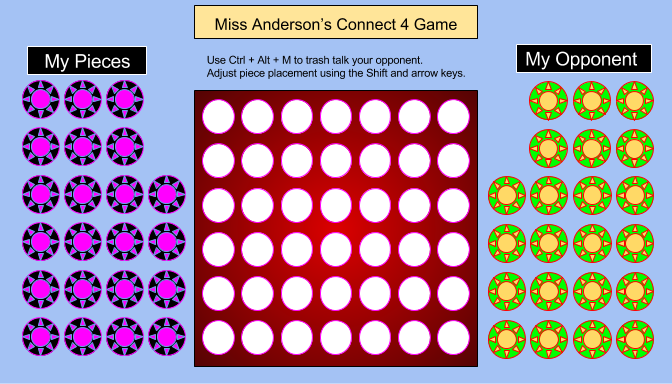 I recently came across her tweet to her blog post: Play Connect 4 Asynchronously. The basic game is made in Google Drawings because it offers the distribute tool, which is unavailable in Slides. The distribute tool is used to quickly organize and space the circles, which become openings in the “gameboard”. After the game is made, it’s downloaded as a png and uploaded to Google Slides as a background to prevent players from accidentally deleting it. With the background complete, I then created the game pieces in Slides. These are the only objects easily moved on the screen. I kept my page setup in Drawings the same for Google Slides; otherwise, the board and pieces looked distorted. 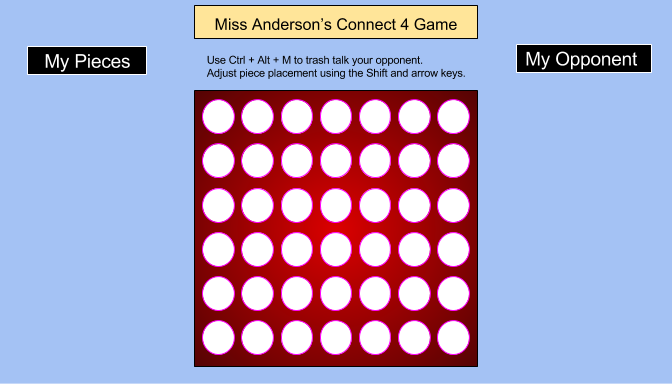 Connect 4 made in Google Drawings, downloaded as a png file. Piet Mondrian, a Dutch painter, is best know for a form of art he called neoplasticism. The art is prepared on a white background, with a grid of black lines and the primary colors: red, yellow, and blue. Young students can easily recreate their own Mondrian style art. When students originally began this project, they used the Kerpoof website. It was loved by kids and fairly simple to use. Kerpoof, owned by the Walt Disney Company, closed April 2014. Instead, Disney moved toward creating mobile apps. The art for this project is quickly created with Google Drawings. Just a few tools are needed: line tool, line weight, shape tool, and arrange. Ctrl + D is also used to quickly duplicate lines. Once completed, I have the students save their art as a png file and have them upload to a collaborative canvas at Padlet. I spent much of my summer vacation searching out new digital projects for my students. I really wanted to do more with Google Drawings. On YouTube, I came across this well-made tutorial from Flipped Classroom. The instructions were clear and simple. Shown at left is the badge I made to award students who create a Mondrian style art project. Years ago, students used the Kerpoof Website to make that artwork, but Kerpoof closed in 2014. 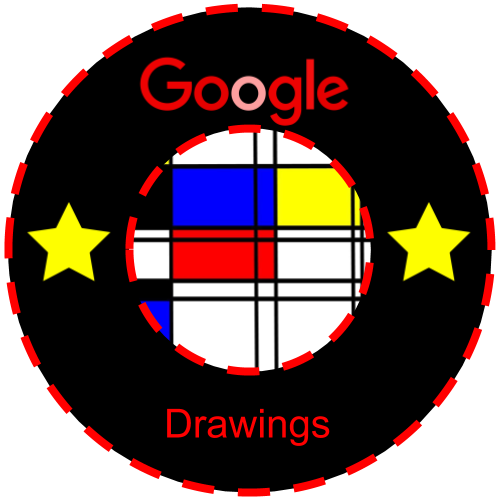 My 2nd graders can now use Google Drawings to mimic Piet Mondrian’s style and earn a digital badge. Kids often place a high value on images over text. In fact, kids will start searching Goggle images for pictures to add to their essays when no visual content is required. ;-( When images are requested, students frequently distort them, either horizontally or vertically. Well, here’s a simple project that takes advantage of that skill. The results can be stunning and Padlet.com is a great way to organize and display completed student projects onto a collaborative canvas. Google Forms can be a great resource for current events. When my students had free subscriptions to USA Today, I wanted to take full advantage of it by having them do more than just read the paper online. Working with 2 web pages at one time, students could bring up USA Today and their current event form, reading their article and filling out the form at the same time (no paper or pencil needed). I kept the form fairly simple to facilitate their ability to complete and submit the form successfully. Student information was collected into a spreadsheet, which I could view and print from docs.google.com. So, rather than giving all the kids a worksheet and collecting 24 papers, I could collect all student answers into a 1-2 page spreadsheet.